The upheaval within Yemen’s power structure must be considered when deciding whether to transfer Yemeni detainees held at the US military prison at Guantanamo Bay, US Defense Department head Chuck Hagel said. Yemen’s President Abd-Rabbu Mansour Hadi and Prime Minister Khaled Baha abruptly resigned Thursday after rebel forces fought with government security and surrounded the presidential residence in Sanaa. "Because of what's happening in Yemen, and we were well aware of -- of the danger and the uncertainty and what was going on in Yemen before today, that has to be factored in," the outgoing Pentagon chief Hagel said, according to The Hill, during his final Pentagon briefing on Thursday. 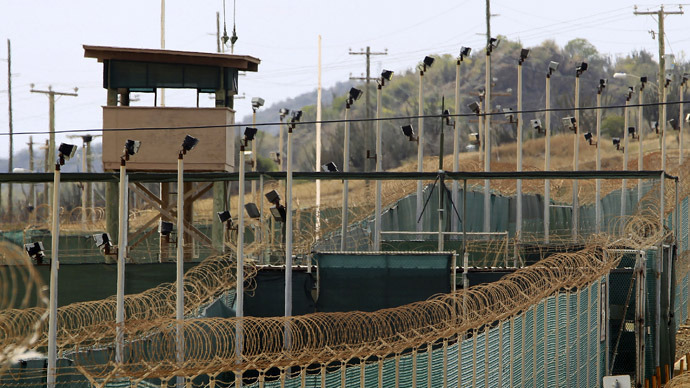 Eighty-one Yemenis remain at the Guantanamo prison, more than any other single group there. A total of 127 detainees remain at the facility, which first opened following the attacks of September 11, 2001 to house suspected militants, but eventually became an international symbol of human rights abuses. The US has long avoided sending Yemenis back to their home nation, citing security concerns and fears some would escape prison there or be set free by the Yemeni government. Yemeni detainees released thus far have not gone back to their home country, Hagel underscored. "It's what country is willing to host these detainees. We've not sent them back to Yemen," Hagel said. Three Yemenis were among five detainees released and sent to Kazakhstan at the end of 2014, putting the total number of prisoners released from Guantanamo in 2014 to 28, the highest single-year total since 2009. The Obama administration has expressed desire to find nations willing to accept so-called ‘low-level’ detainees. US President Barack Obama took office in 2009 vowing to close the facility, where many detainees who remain today have been kept for well over a decade without being charged or tried. Earlier this month, Republican senators, including Kelly Ayotte and John McCain, proposed legislation that seeks a moratorium on the release of "medium- and high-risk detainees" held at the military prison. The legislation would also bar the transfer of any detainees to Yemen for two years. "The last thing we should be doing is transferring detainees from Guantanamo to a country like Yemen," Ayotte said at the time, according to Reuters. A former prisoner of war himself, McCain was once a proponent of shutting down the military prison, but has now led efforts to thwart the Obama administration’s efforts at releasing select prisoners. The Department of Defense secretary signs off on all released prisoners from Guantanamo after an interagency certification process occurs. As secretary, Hagel has signed off on the release of 44 detainees, according to The Hill, though his pace in doing so was reportedly too slow for some in the Obama administration. By Hagel's count, he signed off on 44 #Gitmo transfers. The former senator didn't answer my question on greatest obstacle to closure. Hagel's delays may have played a part in the president’s decision to replace him with a ongtime Pentagon functionary Ashton Carterwho will take over after January 28. "I have always supported the closing of Guantanamo. ... I was probably one of the first in the United States Senate: certainly one of the first Republicans to take that position," Hagel said Thursday. "That said, the secretary of Defense [has] the responsibility to certify the transfer of detainees," he added. "I suspect I have not made everybody happy always, on that point,"he said. "But it's too big a decision to be made quickly or politically. But it is one of many big decisions secretary of Defense has to deal with every day." Just back from presser with SecDef Hagel. He says there are no more #Guantanamo transfers awaiting his signature. So much for acceleration.